Rickard Bensow's research deals with understanding what forms the key hydrodynamic features of a good design and developing computational methods to approach these design considerations. This concerns e.g. hull resistance, propeller cavitation, noise, and propulsor hull interaction effects. Improved designs are characterised by reduced fuel consumption, reduced noise and vibrations, reduced production costs, and improved life span. 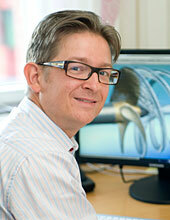 Rickard Bensow is directing the Rolls-Royce University Technology Centre in Computational hydrodynamics. There might be more projects where Rickard Bensow participates, but you have to be logged in as a Chalmers employee to see them.